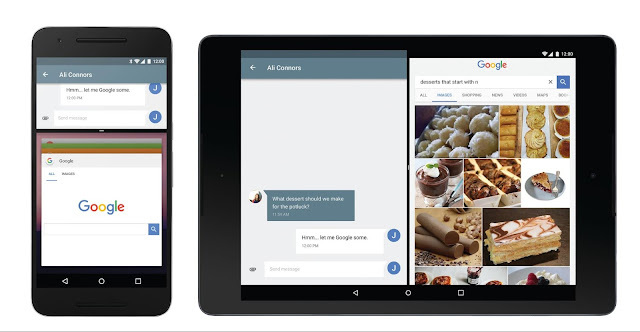 Today we’re happy to announce a Developer Preview of the N release of Android! We’re doing something a little different this year by releasing the preview early… really early. By releasing a “work in progress” build earlier in development, we have more time to incorporate developer feedback. Also, the earlier preview allows us to hand off the final N release to device makers this summer, so they can get their hands on the latest version of Android earlier than ever. We’re looking forward to getting your feedback as you get your apps ready for N.
Multi-window - A new manifest attribute called android:resizableActivity is available for apps targeting N and beyond. If this attribute is set to true, your activity can be launched in split-screen modes on phones and tablets. You can also specify your activity's minimum allowable dimensions, preventing users from making the activity window smaller than that size. Lifecycle changes for multi-window are similar to switching from landscape to portrait mode: your activity can handle the configuration change itself, or it can allow the system to stop the activity and recreate it with the new dimensions. In addition, activities can also go into picture-in-picture mode on devices like TVs, and is a great feature for apps that play video; be sure to set android:supportsPictureInPicture to true to take advantage of this. Direct reply notifications: The RemoteInput notification API, which was originally added for Android Wear, now works in N for phones and tablets. Using the RemoteInput API enables users to reply to incoming message notifications quickly and conveniently, without leaving the notification shade. Learn more here. Bundled notifications - With N, you can use the Notification.Builder.setGroup() method to group notifications from the same app together - for example individual messages from a messaging app. Grouped notifications can be expanded into individual notifications by using a two-finger gesture or tapping the new expansion button. Learn more here. Efficiency - We launched Doze in Marshmallow to save battery when your device is stationary. In N, Doze additionally saves battery whenever the screen turns off. If you’ve already adapted your app for Doze, e.g. by using the GCM high priority message for urgent notifications, then you’re set; if not, here’s how to get started. Also, we’re continuing to invest in Project Svelte, an effort to reduce the memory needs of Android so that it can run on a much broader range of devices, in N by making background work more efficient. If you use JobScheduler for background work, you’re already on the right track. If not, N is a good time to make that switch. And to help you out, we’re making JobScheduler even more capable, so now you can use JobScheduler to react to things like changes to content providers. Improved Java 8 language support - We’re excited to bring Java 8 language features to Android. With Android's Jack compiler, you can now use many popular Java 8 language features, including lambdas and more, on Android versions as far back as Gingerbread. The new features help reduce boilerplate code. For example, lambdas can replace anonymous inner classes when providing event listeners. Some Java 8 language features --like default and static methods, streams, and functional interfaces -- are also now available on N and above. With Jack, we’re looking forward to tracking the Java language more closely while maintaining backward compatibility. 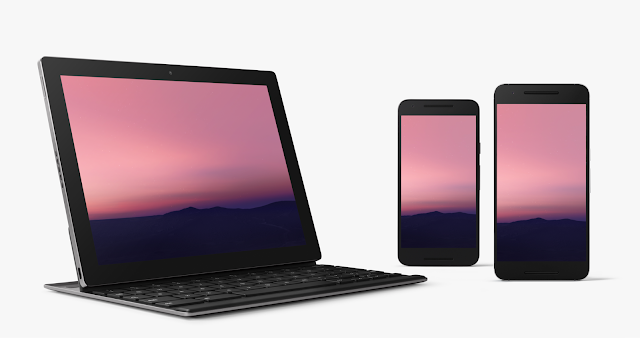 The N Developer Preview includes an updated SDK with system images for testing on the official Android emulator and on Nexus 6, Nexus 5X, Nexus 6P, Nexus Player, Nexus 9, and Pixel C devices (and to help test out these features on a tablet, developers can get a $150 discount on Pixel C), as well as on General Mobile 4G (Android One) devices. This initial preview release is for developers only and not intended for daily use or consumer use. We plan to update the N Developer Preview system images often during the Developer Preview program. As we get closer to a final product, we’ll be inviting consumers to try it out as well. We are also making it easier for you to try out N on your development devices with the new Android Beta Program. Starting today, you can update your Android devices to the developer preview of N and receive ongoing updates via OTA by visiting g.co/androidbeta. Click here for more details on getting started with the N Developer Preview and let us know what you think -- the sooner we hear from you, the more of your feedback we can integrate.